Our campus allows students, educators, and scientists to live what they teach and learn. Our buildings and grounds incorporate systems and design principles that minimize our ecological footprint through the conservation and sustainable use of our resources. Wherever possible, we apply the principles of “green design” to our building projects on campus. These include: maximizing renewable energy sources and the energy efficiency of buildings; minimizing long-term maintenance needs; and using recycled or locally-produced, sustainably grown materials with low amounts of embodied energy (the total amount of energy required to extract, manufacture, and transport a material). We model clean energy technologies with a hybrid wind and solar system that provides much of the electricity used by our school buildings. The hot water needs for all of campus are also met with solar technology and our biodiesel production provides fuel for all of our vehicles and farm machinery. Solar thermal water collectors connected to each building store up to 50 gallons of water per unit. During the day, sunlight passively heats the water up to 180°F, and panels are well insulated such that there is hot water available each morning. Units feed directly into buildings no back-up or booster heaters are used. With the energy of our students and faculty, we are working to expand our school farm with citrus trees and vegetables that will play a significant role in feeding our community. 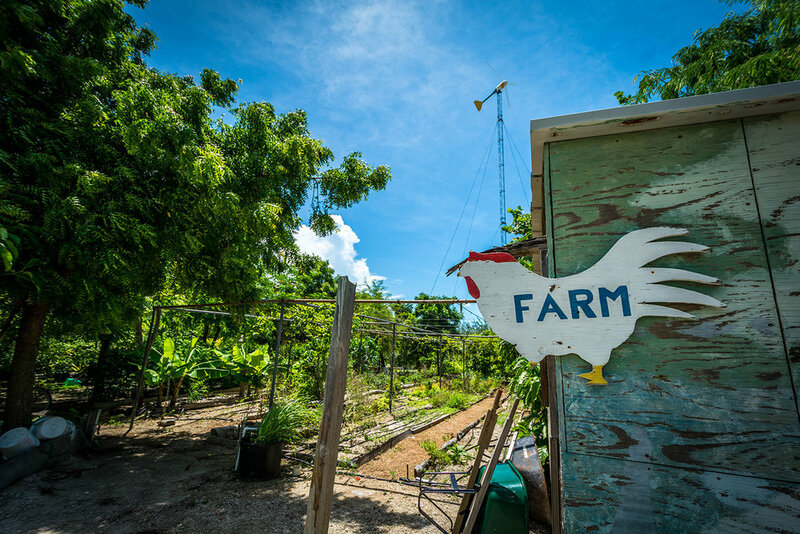 The food garden is fertilized with compost from kitchen waste and watered with a solar-powered pump, providing a viable model for low-cost, high-yield food production in South Eleuthera. Our agricultural systems are designed to grow food for our community, as well as plants for ground cover, green manure, pest management, medicinal uses, and are research projects. Native coastal plants and other organic material will be used to restore the beach-dune environments around campus that have been damaged by past development projects and strong weather. This will help create an important windbreak for the area. On Eleuthera, as on many islands, there is a slim supply of groundwater. 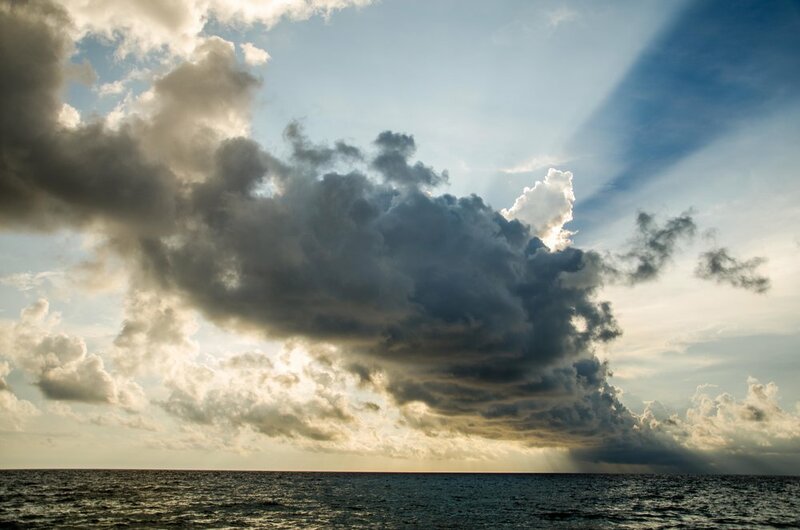 To meet our water needs, rain is collected from roof runoff and stored in cisterns. All members of our community learn to become conscious users of fresh water, challenging everyone to use no more than 10-15 gallons per day. Instilling these conservation principles, water consumption per person on campus is 15% of the consumer in the United States. To further protect our water supply and the fragile reef system that surrounds our campus, we have established an on-site waste management system. A lush, green, constructed wetland adorns the center courtyard of the campus. Human wastewater is cycled through the wetland and provides nutrients for tropical plants while simultaneously being purified so that it is released more safely released into the environment than it would be through traditional “leach-away” tanks that release effluent directly into the water table. Completed as of December 2013, the Center for Sustainable Development shows our commitment to living and working sustainably, and highlights many of the lessons that we’ve learned throughout the years constructing more than 18 buildings between our different campuses. 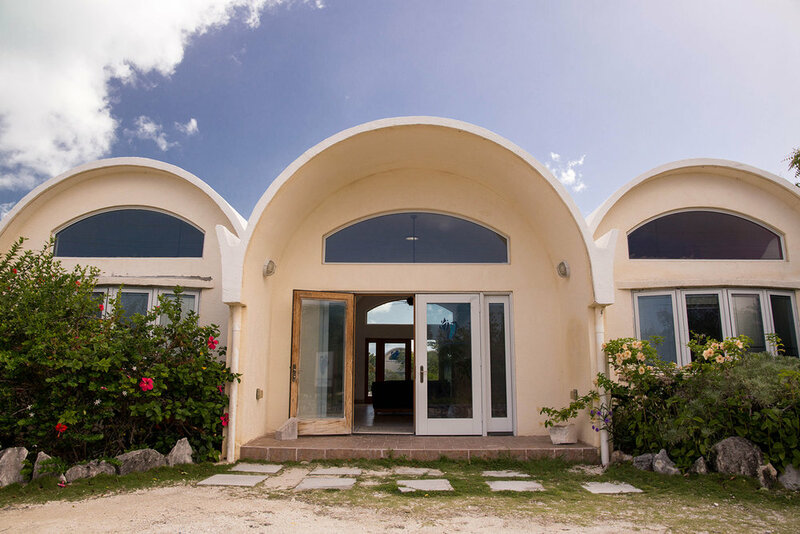 The building incorporates passive cooling through roof air vents, exposes the broad side of the building to the trade winds, and exposed concrete floors act as a large thermal mass, making this the coolest building in the long summer months in the Bahamas. The office is open concept, highlighting our belief in collaborative work and design, but does provide several quiet meeting spaces. The office boasts the first video-enabled conference room on campus, giving a space for both employees and clients to remain in touch with schools and workplaces back home. The first floor of the building houses 4 bays which are used as laboratory and classroom spaces, facilities storage, and the Vanacore Tingum Center which helps manage the recycling and reuse efforts of the organization. The entire building was constructed on four of the largest cisterns ever built within the organization, storing over 170,000 gallons of water. We have four dormitories spread across our campus, a graduate living center and one residence with private accomodations. Two dormitories are located at the Cape Eleuthera Institute which can each accommodate 16 people each. The CEI dorm is divided into two separate rooms, containing eight beds each with an adjoining common bathroom. Two other dormitories are located on the Island School campus and can accommodate 24 people in each. Each dorm is divided into two wings which can contain a maximum of 12 beds and a separate bathroom. The wings are separated by a shared common room with couches. These larger dorms are available mid-December through February and mid-June through August only. Our newest dormitory, the Anderson-Cabot Graduate Hall, incorporates green design principles and locally produced materials. The building has space for more than 40 beds. Hallig House is the hallmark of our campus, showcasing our belief that we can reduce our impact on our environment and live more responsibly in a place. It represents an opportunity to engage visitors of all ages into thinking about how built spaces can reflect our values about community and the environment and inspire creative thinking. The building was designed as an educational model for island nations. Led by Warren Wagner of W3 Architects and designed by a team of conservation systems specialists, the building features innovative elements that solve specific regional issues. The building’s structure and shape, construction materials, and renewable energy and waste management systems all demonstrate how local and national development can maximize locally available resources while minimizing impact on local environments. The insulation is made from recycled denim, the kitchen counter top from recycled glass bottles, and the decking from post consumer plastic and tires. Other design features include 14 photovoltaic panels to power the building, two passive solar hot water heaters, and rain water catchment systems for running water needs. High efficiency appliances and fixtures allow Hallig House to be a new exported of energy and water.